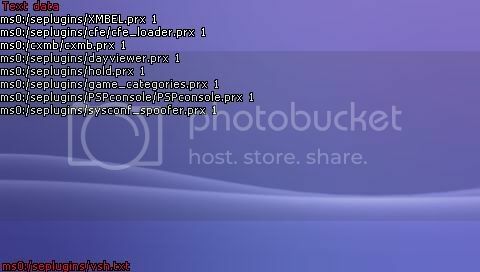 Here will be a few things you could do, now that you have CFW installed on your PSP. copy the data you would like to keep to the computer, then format the MS from the XMB to create the appropriate file structure. 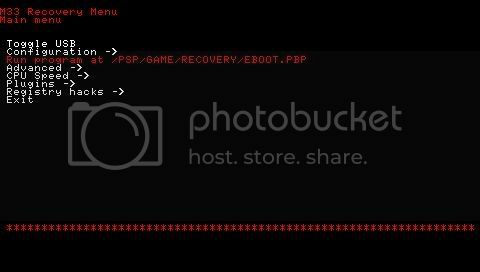 You need to reboot your psp while holding the R button, to enter the Recovery Menu. Once inside, you need to go to configuration, and change UMD Mode to Sony NP9660. as shown. if your using GEN,, you can change the Use VshMenu option as well, this will be your preference for the menu that pops up in the XMB when select is pressed. this is optional. M33 has only an on/off option for this, but is on by default. Exit out of these menus, and the PSP will restart. Now that that is done, you should no longer see this screen when a ISO is started. Their are a lot of good plugins that you can use. All of them will have to be activated before use tho. To do this we will need to add the appropriate lines to the appropriate .txt. If your plugin is used in the XMB you will have to add it to the VSH.txt inside the seplugins folder, if its used in game, add it to the game.txt in the same folder, or add it to both if necessary. Most things come with a readme.txt, read it for additional information regarding the use of the plugin you have. notice the 1 after the plugin? that means the plugin is activated. If you don't want it activated you can add a 0 instead, or just don't add the 1. Plugins can be activated and deactivated via the recovery menu as well. Infact most readme's wont tell you about the 1 or the 0 after the line, and just make you go to the recovery menu to enable it. Then extract the contents of the folder, you should get a game_categories.prx. copy the .prx to the seplugins folder, and add the line, "ms0:/seplugins/game_categories.prx 1" to the vsh.txt. now we can add folders. Lets make a UMDs folder. as shown here. to do this we simply make a folder inside of the ISO folder on our MS, and name it CAT_UMDs. Add any ISOs you have in the ISO folder to the folder we just made. To make the HOMBREW folder that I have in the pic, you make a folder in the game folder (ms0:/psp/game/) and name it CAT_HOMEBREW. simple huh. add the apps you want to the new folder, and viola. You can make your own categories by simply adding a folder, and naming it CAT_ then whatever you wish for it to say. One of my favorite pugins, is CXMB. Its the best way to customize your psp, IMO. No need to alter flash0, just add this baby to your MS, vsh.txt, and find ya some themes. Did you get a theme for the CFW you are using? If not, this will not work. 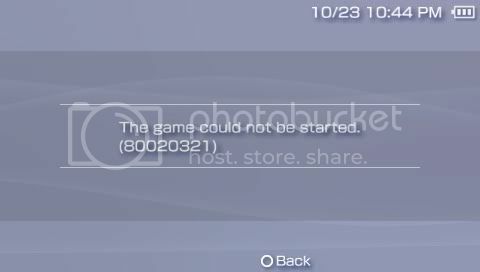 Copy the .ctf file to "ms0:/psp/theme/". 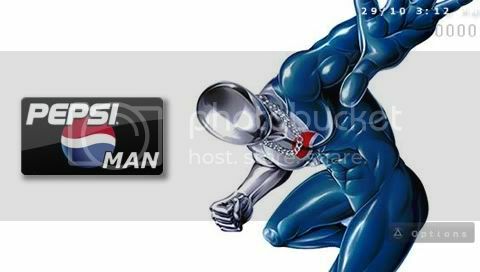 In the XMB go to theme, and select your new theme. The psp will restart, and your new theme will be applied. Some .ctf themes also have added colors, which are full pictures, that sit behind the waves. check em out right under the theme icon. Also notable, is the Custom Intros, and Gameboots that your new theme may have, your gonna notice the intro as soon as it comes back on, but load a game and see what gameboot they have used in the .ctf you selected. With this plugin you can add the day of the week to the XMB, or if you feel like it, you can change the day_viewer.txt file to have a custom text for every day of the week. In the event that something has gone wrong, you can use Hellcats Recovery Flasher to reflash your CFW, or OFW. Make sure you add the folder "Recovery", that came in the download, to the game folder, then reboot the psp holding the R button, you should see this. click Run program at.... the one highlighted in the pic. you must have the eboot.pbp from the version of FW you plan to flash, on the root of your MS.
use the TUT by Scorpus for more detailed information. Look forward to more tut's here, added soon. This is based on GEN recovery menu, you may want to add this. Other than the fact that you don't need to turn on the VSH menu in M33, their pretty much the same. unless they have a chickHEN modded psp. guess i could add it tho. I'm gonna add more later, i got busy working on a couple comps for a friend. least it pays. Last edited by chAosDaJuggalo; 10-28-2009 at 06:20 AM. You should add info for Popsloader, changing the Game Folder Homebrew for emulators, and maybe LEDA. ya know, I've never had to change game folder for homebrew to work, my emus work fine. Never used leda, and I'v never had to use popsloader, but I've only played one PSX game. If any one has written anything they would like to see added to the list, hit me up. Last edited by chAosDaJuggalo; 10-29-2009 at 04:29 PM. This is a great thread! The info on the custom folder creator was really useful! Thanks a lot! +rep left!! !